Looking out at the Columbia River, Portland International Airport is a premium facility known for its exclusive access to a slue of airport hotels alongside unique amenities that include an on-site art museum and live music acts. Arrive to the area with ease by making sure your transportation is ready and waiting, a task made simple if you’re looking out for the right ride. Utilize the many free shuttles provided by nearby business stays, including Red Lion Hotel Portland Airport and Embassy Suites by Hilton Portland Airport, both of which are less than a couple miles away. Keep on trucking by looking beyond the simple convenience of a complimentary shuttle. Turn each corner with the ease of a steady hand by making sure you’ve got a solid ride to move you along, booking a private sedan or taxi to make your business trip to the Oregon Convention Center that much simpler, or utilize the space of an SUV to take the whole family out to Forest Park. Another way of making the time pass is by having nothing but view to look out on, something easy to do at the hand of a chauffeur via luxury limousine, or a knowledgeable local personal driver who can not only take you to the Pearl District, but tell you all about it. With some of the best and most affordable transportation, SuperShuttle has been an industry leader when it comes to airport pickup and drop off. SuperShuttle is a staple at the Portland PDX airport. Those famous Blue Vans will be ready at the baggage claim to take you where you need to go in this trendy and beautiful city. With professional drivers would can meet you right after you leave baggage claim and be ready to get you through traffic when you are in a hurry. While at PDX airport private sedan and limo services can be booked with Northeast Town Car Portland, which is also available to provide any luxury car services a traveler may require. Save up and enjoy more by booking our private vans with drivers that have your best interests at heart and the best knowledge of Portland in their minds. Visit places like the Washington Park and the Oregon Zoo. Travel around Portland by our private vans for cheap and experience Oregon at its best, while visiting places like the Portland Japanese Garden and the Lan Su Chinese Garden. Need a luxurious, comfortable ride from the airport? Book a luxury sedan to transfer you and even transport you to places like the Pittock Mansion and the Portland Art Museum. Dial-a-driver to experience Portland at its best; with highly trained professional driver guides that will show you the best of the City of Roses in Oregon. Our private chauffeurs will take you there in no time at all, whether it is the Aladdin Theater or the Hollywood Theater. The best and the fastest this city has to offer, but also the cheapest. If you need to get to the Providence Park, we provide private taxi service to transport you to and from the home of the Portland Timbers. Live the high life as you ride around town in a world-class limo with high-quality chauffeurs at your beck and call to transport you wherever you like. Travel with your closest ones in our Buses for hire for groups and families. Taking you everywhere from Oaks Amusement Park to Forest Park. Navigating your way through PDX has never been easier. Make the most of your time and be sure to check out all of this airport’s great shops and restaurants. PDX airport variety of shared ride and private car services makes getting around the city or downtown Portland area easier due to the well designed layout of the airport with SuperShuttle being one of the most popular shuttle options. PDX airport has limousine rides and executive sedans for incoming travelers looking for a transfer to hotels downtown or in neighborhoods close to the airport. Blue Star Transportation, Super Shuttle and Sunrise PDX Airport Shuttle are all known to provide great service to their customers. Our local providers also service the Oregon Convention Center for those needing share ride or private van service. If you are traveling by taxis then you can find that they are easily accessible with drivers who can speak a variety of languages to assist international tourists and travelers who are coming to the area for the first time. You can find Portland hotel transportation in most locations in the downtown and metro areas. 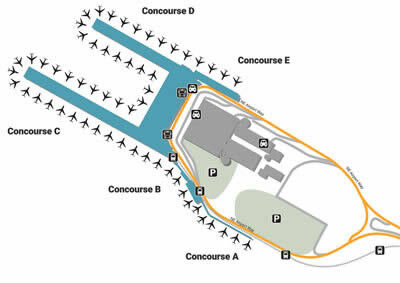 Portland International Airport or PDX is located in the city of Portland, Oregon. With millions of tourists passing through the airport annually it ranks as one of the best in the western part of the United States. The main river that runs through Portland is the Columbia River, which helps with the transportation of cargo throughout the city. Some of the attractions are the Oregon Zoo, which has many exotic animals and is a very family oriented place to go. Since this is the City of Roses you should visit the Rose Test Garden people tend to flock here to get a good feeling for the city, the fresh greenery and flowers. You can understand why people love the peaceful settings of the many gardens here in Portland you can feel the Zen in the Japanese Garden while seeing bonsai trees and hear the drizzle of water fountains and the hush of the ponds. Portland happens to be the corporate headquarters of Nike, which employs thousands of people. PDX airport is very important to the state due most passengers fly in and out of this airport is important to airlines such as SeaPort Airlines due to the location near the ocean. Portland has a population of over half a million people and ranks it high in regards to other U.S. cities in America in terms of population, one thing that attracts many people to the area is the atmosphere. Portland tends to be a very earthy city with tons of gardens, which is why it’s probably known as the City of Roses. Portland is also known for the performing arts and the center they perform in. What better day of relaxing then to visit one of the gardens then at night go see the Oregon Symphony? If you like the ballet then a must see is the Oregon Ballet Theatre its an amazing show and fairly cheap for the price of a good show. Portland’s film festival has something that no other city can claim, has the HP Lovecraft Film Festival, with all of luxuries that Portland offers you one thing you can count on is a very Eco friendly city that is relaxing but yet still up to date on all of the entertainment. This is the great outdoors city that is nestled between San Francisco and Seattle. Portland, Oregon is well known across the country for it’s art community but this eclectic city offers so much more. Its breath-taking gardens and fantastic museums make it place you’ll want to visit again and again.